Learning how to deep clean hardwood floors can be a multiple step task. However, when you take these steps to clean your floor, you are also taking steps to extend the life and beauty of your hardwood floors. ​Unlike tile or laminate flooring, hardwood is both naturally beautiful and incredibly delicate. A lot of care must be put into how you clean hardwood, and depending on how it is finished, you'll have to follow several steps to clean your floors in a safe manner. Hardwood floors typically have some kind of finish on them. This finish is typically a polyurethane or polycrylic, and it is what protects your flooring from liquid, stains, and dents. Before you begin cleaning you will want to know ​if your floors are sealed. Most interior floors are sealed (or "finished"), but if you're pulling up old carpet and discover flooring, they might not be. Knowing whether your floors are finished will dictate what kind of base cleaner that you can use without causing any damage to your floors. ​A simple test to determine if your floors are finished is to pour a tiny amount of water onto them. If the water beads up, chances are you have finished, sealed flooring. Sealed floors and engineered hardwood floors are stain and water resistant. This makes cleaning simple and allows you to not have to worry as much about what you put on them. ​Polyurethane, polycrylic: Strong finish that is water and stain resistant. The longest lasting and best type of finishing for your flooring available. Varnish, shellac: While a finish, it isn't as strong of one. Will resist stains and liquid but must be treated with more care. Penetrating seal, tung oil: Not meant to be used indoors, very rare to find on interior flooring. Be very careful in cleaning. If you are wanting to know how to clean hand scraped hardwood floors, then you're in luck: they can be cleaned the same as sealed floors. Cleaning hand scraped floors can take a little more work since they have more texture and con-caved areas for dirt to hide in. Treated floors are still susceptible to water damage. While they can handle some water or cleaners, you really want to make sure you don’t leave excess water on the surface. Untreated floors are very susceptible to water, you can still use it to clean but you will need to take extra steps for drying. We will dive further into what cleaners are best for your type of wood floor below so that you can learn how to deep clean hardwood floors without damaging them at all. ​Deep cleaning your hardwood flooring is a several step process. Before you can get into the "deep, thorough clean", you need to start by ensuring all of the dust, debris, and dander are off the floors. For long term care, its best that you routinely sweep and/or vacuum your hardwood flooring. This will keep things from getting ground into the floor, which can permanently damage it. Lets review sweeping and vacuuming first, and then move into the deep clean. Dirt and debris can be the worst enemy your floor has. This is because over time, the particles can be rubbed into your floor, rubbing in and scratching away the finish. If you can’t find time to sweep your floors everyday, then try to aim for the high traffic areas. This will cut down on dirt buildup. Entryways and hallways are usually the worst areas that gather dirt and debris. Instead of sweeping, you can opt to use a dust mop. A dust mop doesn’t simple push dirt around, it captures it and hold on until you remove the pad to clean or shake it off. Dust mops come in a variety of widths so you can find the one that fits your home for easy and quick cleaning. ​Daily sweeping is also the best way to clean dark hardwood floors. When your wood floors are very dark, dirt will show up very easy. Using a broom or dust mop on your floor daily with help knock out the debris that is tracked in. ​Use area rugs to help trap dirt and keep your daily sweeping to a minimum. A small rug on the inside of a doorway is the first defense against dirt. It is also a great spot to encourage storing shoes. This will help keep dirt from being brought further into the home. A runner in the hallway areas or large area rugs in living spaces can help protect your floors as well. Its really easy to clean area rugs, and they will trap a lot of the dirt and debris that otherwise would get ground into your hardwood floors. ​Another great way to deep clean hardwood floors is to use a vacuum. However, you don’t want to break out your everyday vacuum on your hardwood floors because the rotating bristles can damage your floor. The brush roller, designed to help agitate dirt and debris on carpet, can rip up and scratch your hardwood flooring. ​Use a hardwood floor attachment or the hose attachment ​on your regular vacuum. Use a vacuum that has been designed for hardwood floors, and either has not brush roller, or an adjustable brush roller. Use a vacuum designed for laminate floors, which will have strong suction and the same characteristics as hardwood flooring. When you vacuum your floors, you are able to get up more dirt and dander than using a broom or dust mop. 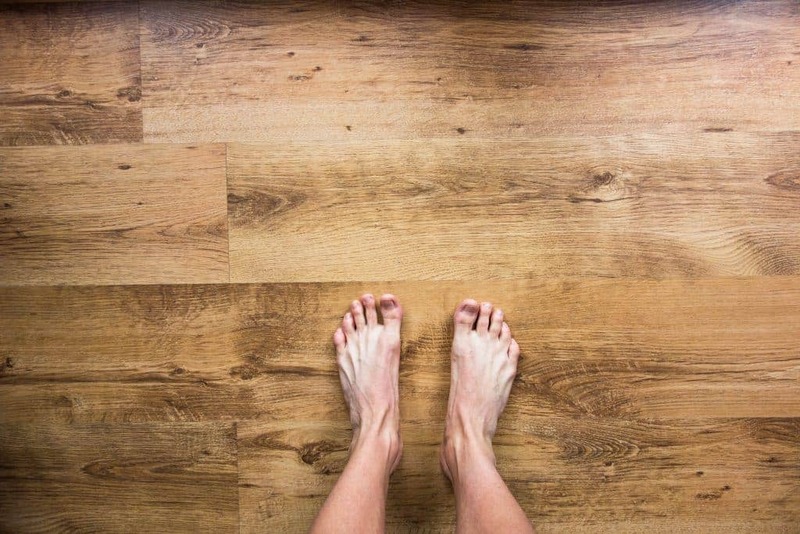 This is a great step you can take once a week to ensure your floors stay clean. Vacuuming is also the best way to clean dog hair off hardwood floors. It easily pulls hair out of any cracks and can reach corners better than a broom to pick up any that has gathered. If you don’t want to use an attachment then there are floor vacuums available. These vacuums have bristles that won’t touch the floor or have incorporated a brush off switch that stops the bristles from rotating. While many people think of deep cleaning as penetrating the surface, the best cleaning you can do for your wood floors is above the surface by removing dirt and debris. ​We've put together a comprehensive review, where we found the ​best​ cordless stick vacuum on the market​. ​You shouldn’t need to mop your floors very often. If you can take care of removing dirt on a daily or weekly basis, then your floors should keep a nice clean shine. ​Less is more: The less water you use, the more your floor will love you. Water has a very real and large potential to damage even sealed wood floors. Don't slosh: When you mop, don’t slosh water all over the floor. Wring out your mop head so that it is damp. Dry Quickly: After you have mopped, use a dry towel or rag to clean up any puddles left behind. ​After mopping, its time to break out a cleaner for the deep clean and shine that you're looking for. It is vital you pick the correct cleaner, though. Certain cleaners can ruin a finish or make your floor sticky due to the chemicals reacting with the finish type. Any strong chemicals such as ammonia​. ​Any sort of​ abrasive cleaner (think steel wool) - an abrasive could potentially scratch the finish. ​Anything alkaline based - this will dull your floor​. ​Vinegar - while vinegar works great on unfinished flooring, it will dull your finished flooring, removing that shine that you love. A cleaner that is specifically recommended by the floor's manufacturer. This is a lot easier to determine if you were the one to have the hardwood floors installed. ​Water ​mixed with a ​several teaspoons of Dawn. This gentle, soap based cleaner won't damage your floors, and should be applied with a mop. You'll usually want to do this multiple times, drying in between. ​Steam clean hardwood floors. This method of cleaning uses steamed up water to penetrate into the cracks and hard to reach spots on your floor to clean dirt, grime and sanitize all at once. Steam cleaning sounds great, but you ​have to be 100% certain you're doing it on sealed floors, since it is a concentrated use of water than can potentially damage and warp your flooring. If you need help figuring out how to deep clean hardwood floors when they have stains, marks or spills then there are a few safe tricks you can use to bypass a full floor cleaning. ​Any sticky items like gum can be removed with a plastic bag full of ice. Just set the ice on the gum until it becomes brittle. Then you can carefully remove it with a plastic scraper. ​Scuff marks can be rubbed out with a tennis ball. You can cut the ball to fit over the handle of a broom or long stick to save you from bending over. After sweeping, simply use the tennis ball to buff out the marks. ​Nail polish or paint can be wiped up using rubbing alcohol. Alcohol is a neutral ph balanced product so it won’t bring any harm to your floor. Just don’t soak the floor, use a cloth to rub the alcohol onto the stain. If you come across any sticky residue, then rubbing them gently with olive oil or vegetable oil will take care of it. Place a few drops of oil on the residue, let it sit and then wipe it away with a microfiber cloth. ​Deep scratches can be worked on with baking soda. ​Just sprinkle a little bit onto a damp rag and rub onto the scratch. Start gently and work up to a harder rub if the scratch doesn't come up immediately. You may need to repeat one more time to get it all up. Then follow up by cleaning the area with a damp cloth. For pet accidents and stains, the quicker you are able to clean them the better. You can opt for a 1:4 vinegar to water solution to quickly clean it. It wouldn’t hurt to follow up with a rubbing alcohol or cheap vodka treatment. Keep in mind vinegar is not great for finished flooring, so use this method sparingly. Clean it up quickly by rinsing with water. This will ensure the area is sanitized, since animal urine and poop can contain high amounts of bacteria that can harm us of we come into contact with it. Take care in the future to clean your pet's paws before letting them back in the house to minimize dirt and debris. Using gentle, natural floor cleaners on hard stains and spills will save you from having to strip and refinish your flooring. Use these tips to know how to clean old hardwood floors without sanding. That way you can continue to enjoy your floor and take care of them with ease. If you have heard of the wonder of vinegar in the household and you are wondering how to clean hardwood floors with vinegar, then here is how. Vinegar can potentially dull your hardwood floor because of it’s alkaline properties. However, it is a great cleaner and when diluted with water it helps cut through dirt and grime on your floors. You can also add a few drops of Dawn to make a double duty cleaner. Or instead add some essential oils to the water and vinegar mix to brighten the smell of your floors. Vinegar and water mixtures are a great choice if you need to know how to clean unsealed hardwood floors. This cleaner is gentle enough on untreated floors for cleaning. Just make sure you don’t soak the floor since an unsealed floor is highly susceptible to water damage. You can also use Murphy Oil Soap for when you need to learn how to clean unfinished hardwood floors. Despite the word oil in the name, this is a natural based soap that does not contain any oil. Since you are mopping unsealed floors, it is very important to make sure your mop is only damp. After you mop, follow behind with a dry towel or two to wipe your floor. You can also use ceiling fans to circulate the air in the room. This will help your floors to dry faster. When you follow these steps on how to deep clean hardwood floors then you will be able to keep your floors looking clean and shiny. If you dedicate the time to your hardwood floors then they will pay you back by lasting a lifetime.